Born: August 18, 1862 in Somerville Ma. Died: August 13, 1901 in Cataumet Ma. at 30 yrs. ; Mary/Minnie, her parents & sister, Anna Genevieve Davis Gordon, were murdered by nurse, Jane Toppan. Married: July 5, 1888 in Chicago Il. 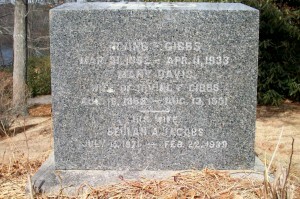 To: Irving Foster Gibbs, Capt. (1862 – 1933) (Paul Crowell Gibbs, Capt. & Maria Elizabeth Barlow); Irving married (2) Beulah Alice Davis Jacobs (1871 – 1939) (Charles L. Davis & Caroline A. Lane) in New Bedford Ma. on July 2, 1906; Beulah married (1) Adelbert Eugene Jacobs (1864 – 1899) (John H. Jacobs & Julia Welch) in Somerville Ma. on October 31, 1893. 1. Paul Davis Gibbs; (May 15, 1889 – April 26, 1951); Married Teresa Julia Dunn (1888 – 1962) (John Dunn & Jane Brophy) in Brighton Ma. on April 15, 1915; Paul & Teresa are buried in Cataumet Cemetery. 2. Jesse Stebbins Gibbs; (April 30, 1891 – May 3, 1957); Married (1) Helen Jacobs (1895 – 1918) (Adelbert Eugene Jacobs & Beulah Alice Davis) & married (2) Ethel R. (–) in Fitchburg Ma. in 1926; Jesse & Helen are buried in Cataumet Cemetery.